These disappeared so quickly, I barely had time to get out my cell phone to take the photo. 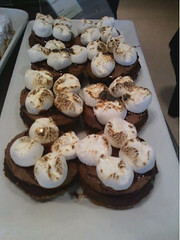 A clever take on s’mores, they were offered in our Genomics Café on campus at Princeton University last week. A graham cracker base was topped with chocolate cake (not too sweet, either, which was a relief), and a smear of frosting which anchored those cute torched marshmallows. How could I resist? But at least I had the sense to cut mine into fourths and share it with friends. Honest!